This post is a guest post by Morgan Downey. Morgan is a commodities trader and author of the recent book "Oil 101". Recently, there has been a growing call for the U.S. to increase gasoline and diesel taxes to the levels that exist in Europe in order to encourage efficiency and reduce oil imports. However, there are fundamental differences between Europe and the U.S. that make this model unsuitable for here. In this post, I look at the reasons the European model appears unsuitable here and propose an alternate method of encouraging fuel efficiency, even when gas prices are low. 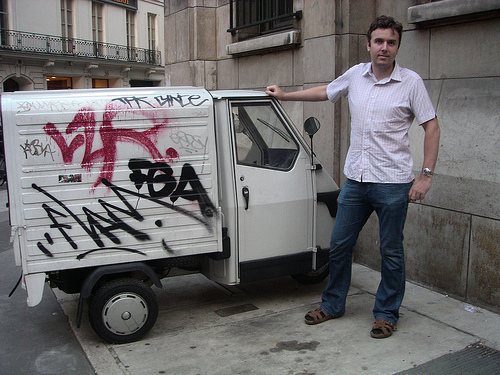 Author beside small vehicle in Paris. There are several fundamental differences between the Europe and the U.S. that make the European model unsuitable here. First, there are major differences in population density between the U.S. and Europe. High gasoline and diesel taxes are effective in encouraging public transportation use in Europe in part because their high population density makes public transportation a convenient alternative. But U.S. population density is much less than a third that of France, Germany, Italy and the UK. American drivers would simply suffer the taxes without access to mass transit transportation alternatives which require European level high population densities. Second, North America’s geography dictates far different commercial transportation patterns. The European Union has seven times more coastline for its landmass than the U.S. European commercial seaports are thus in close proximity to consumer centers and less road trucking is required. In the U.S. two large coastlines require commercial trucking to haul goods inland. U.S. businesses cannot easily avoid using oil burning trucks, making a diesel tax an unavoidable and stifling cost to businesses rather than encouraging efficiency. Third, car ownership is spread widely across the wealth spectrum in the U.S. compared to Europe. A fixed gasoline tax would account for a much higher percentage of American working and middle class discretionary income at a time when such working families are struggling to make ends meet. Given these fundamental differences, the U.S. should be looking for solutions appropriate to our circumstances, rather than adopting ill-fitting models. The U.S. can make far more progress by using a simple vehicle efficiency market to increase efficiency and lessen oil imports. Before outlining how the vehicle efficiency market would operate, it is essential to briefly describe an unusual and somewhat counter intuitive effect of improvements in efficiency: when fuel use technology enables improvements in efficiency, it leads to higher overall consumption. This is known as Jevons’ Paradox. In his 1865 Book ‘The Coal Question’, William Stanley Jevons observed that, as coal-powered steam engine efficiency improved, coal consumption increased. The cause was market prices for coal. Increased coal prices led initially to improved efficiency technology. This caused coal prices to fall, which spurred increased consumption. As oil consumers, the situation we face today is similar. Over the past 30 years, there have been huge advances in engine efficiency technology; yet as oil prices subsequently fell, consumption grew. Drivers in the U.S. chose to forgo efficiency technology gains by driving larger and more powerful cars. As a result of higher prices over the past three years, oil consumption efficiency in the U.S. has increased. Consumers began buying hybrids, diesels, and smaller cars rather than SUVs. Increased efficiency caused oil prices to fall. However, now that oil prices have fallen, there are nascent indications of a recovery in the percentage of SUV sales relative to cars. Resolving Jevons’ Paradox would require separating efficiency from oil prices. A vehicle efficiency market involves subsidizing efficient cars with money raised directly at the point of purchase from buyers of inefficient cars. The efficiency of a car relative to the rest of fleet sales would be determined by a monthly miles per gallon (MPG) assessment. The monthly MPG balancing point would be posted on the Internet and at all new car dealer showrooms along with the schedule of credits or levies. Consumers would pay or receive a cash amount depending on whether the vehicle purchased was under or over the average miles-per-gallon (MPG) balancing point for the prior month. The further a vehicle is from the average MPG, the higher the cash payment or credit. Taxpayers nationwide would not have to pay any additional taxes. There would merely be a simple direct cash transfer from those who are inefficient to those who are efficient. There would be a constant incentive for consumers to purchase more efficient vehicles, even when oil prices are low. Creating a vehicle efficiency market makes sense for America; it’s fair and easy to implement, and it achieves the goal of reduced oil consumption in a manner that fits the U.S. context, rather than trying to impose an ill-suited gasoline tax that simply won’t work here. Just as consumption cannot exceed production, also consumption cannot fall short of production. "Demand" recently has fallen considerably due to the economic slowdown, but consumption hasn't changed much, because production hasn't changed much. The discrepancy is remedied through lower prices, which increases demand and lowers supply. Thus, if a high tax were placed on gasoline tomorrow around the world, consumption would remain about constant, because production would be about constant. Prices would fall. Ultimately, if there were higher gasoline taxes, this would result in gasoline prices that were so low that investment in oil production would be unprofitable. Then, production would dwindle naturally until prices rose high enough that investment in oil production became profitable again. 4 million barrels per day down. Not much? Used vehicles make a mockery of this idea. Not only are these generally less efficient than new vehicles, if new less efficient examples (eg SUVs) are taxed, then there will be a massive market in the worst of the worst. Better to take measures that impact both the new and existing fleet outside times they are traded - pushing off the road the worst examples preferentially and quickly. ... if new less efficient examples (eg SUVs) are taxed, then there will be a massive market in the worst of the worst. Are you saying there's less of a market in them now? To the extent that feebates reduce the sales of new guzzlers, the market gets tighter and they become less attractive price-wise. Agreed that a steep fuel tax would be far more direct, and affect usage as well as purchase. Getting back to Jevons' Paradox, there is no paradox. Increasing the efficiency of the steam engine created more useful output per unit of coal; the work-product of the coal was cheaper even if the coal became more expensive. If the supply of coal was limited by other factors, the premium on efficiency would increase. Your concern is that the lifespan of innefficient used cars would increase (especially heavy vehicles in order to avoid the VEM charge). A possible solution would be a "time-charge" such that for every vehicle over 10 years old its owner is assessed an efficiency charge every year of one tenth of the equivalent mpg new car which is held in an account, only to be used to purchase a new efficient vehicle. The existing vehicle fleet is not incompatible with a Vehicle Efficiency Market. The way to deal with poor efficiency is to deal with the the fleet as a whole, rather than concentrating on new vehicle sales, or even all vehicle sales. Tax on the basis of fuel usage, and tax on the basis of efficiency. Forget what's on the forecourt and focus on the basics, the low level behaviours. If that means banning all passenger vehicles with less than 20mpg from the roads, then do that. 25mpg the year after that, 30mpg after that. And KISS; less avenues for fraud that way. Europe actually has other efficiency incentives besides the high fuel taxes. Vehicle registration (or road tax) in many countries was historically based on engine displacement or some other size formula, e.g. Kei-class minicars in Japan have a lower tax rate and are exempt from some parking regulations. Many countries are now moving to a road tax based on CO2 emissions. Compare that to the US where car registrations are based on purchase price and a depreciation formula. I think adding weight and efficiency to that formula makes a lot of sense. Heavier vehicles cause more wear and tear to roads, so a registration surcharge based on weight has the political cover of being "user fees" instead of taxes. I'm w/dwcal. We would do ourselves proud just to begin to base the vehicle license fee on weight. I believe one or two states, certainly Hawaii, already do. That would both encourage efficiency (which correlates to weight) and discourage consumption in utilizing all (any source of) energy applied to the end of vehicular travel. And yes, it feels more like a mere user fee for a public good--a highway or bridge or library--than a tax. That would at least offer SOME political cover. Not that we also don't need and deserve an INDEXED (percentage of the cost, rather than a fixed amount in cents, per gallon) gas tax for putting roads and freeways back into decent shape. But let's not get too ambitious. First off, let's be honest that a fellow in a husky Land Rover should not be let off scot-free (without considering vehicle cost as a function of weight) for putting considerably more wear and tear per mile travelled on the selfsame public right-of-ways upon which I travel and rely as I attempt to negotiate life in my wispy Geo Metro. Damage is proportional to the 4th or 5th power of the axle weight. Which means that medium & heavy trucks, buses and even garbage trucks do much more damage than Land Rovers. Public works engineers ignore private auto traffic (all sizes) when calculating lifespan of roads. You're probably right about that. I'd guess the biggest public cost of adding a private auto to the road is the traffic congestion which degrades service and necessitates road expansions. In this respect, any car big or small will be about the same because of safe following distances, etc. Still, vehicle license fees based on weight with an exemption for hybrids and diesels would be a de facto efficiency tax. The article cites http://www.sddot.com/docs/SDDOT_Truck_Briefing_2d.pdf which contains on the second page a table of pavement lifetime consumed as a function of axle load. A regular car uses .001 of the road life as a truck. Even the classic Hummer H1 with a read GAWR of 6,800lb is going to do less than 5% of the damage of one freight truck. A 10% weight reduction on a truck would increase road life by 50%, but require 10% more trips. 20 years ago when I was a graduate student living in England I didn't want a car with an engine bigger that 1.6L because it would increase my insurance rate and road tax substantially. Other sources put it at the 5th power. I am agnostic and believe the truth likely varies depending upon circumstances. My problem with Morgan's feebate program is that it only affects fossil fuel vehicles and doesn't actually encourage the use of alternatives to those vehicles. In fact, it seems arguable that such a program would actually reduce fossil fuel consumption. A revenue neutral tax on fossil fuel use would accomplish more for the same effort. But I like Morgan's scheme more than rebates/grants for fuel efficient vehicles. As someone who commutes by bicycle year round, I hate seeing my tax dollars encouraging any fossil fuel consuming vehicle purchase. I sure didn't get a rebate on my last bike purchase. Can you give an un-detailed summary of whats wrong with the logic? I'm serious, I'd really like to know, cause I'm not picking up on it, what am I missing? The USA is not so different from the EU (and Australia is even less dense and fuel efficiency of ALL Aussie cities beat EVERY US city, even NYC, SF and NO). The case for USA water transport is below (barges). The US has a better rail freight system than the EU and we could make that almost zero oil easily, and shift lots of freight from truck to electrified oil (just tax oil and they will electrify). And most travel is local in the USA. Promoting better urban forms is a priority that is missed. (Gas taxes would help). VMT is NOT impacted, just specific gas use. Many farmers and others have a need for a limited use fuel guzzling truck (haul cattle to market and to bring hay in for the winter for example) that may be used <1,000 miles/year. Not much impact on US oil consumption (and most would agree the oil used is a priority use). All in all, slightly better than nothing, but only slightly. Simply raising CAFE standards would do the same thing with less complexity and cash floating around/administrative costs. My issue with US CAFE standards is that they have been simply a rubber stamping of existing efficiency capabilities rather than incentivising efficiency. Since 1983, US$735million has been levied against auto makers via CAFE. No US or Asian auto maker has ever been fined via CAFE. It is effectively a sly tax on luxury European auto makers (Porsche, Mercedes etc) which account for only 8% of vehicles sold in the US. The US Energy Independence and Security Act of 2007 set an ultimate CAFE goal of 35mpg by 2020. I don't think this is agressive enough and I don't think any administration will have the guts to call for for more stringent levels. By putting a price directly on efficiency via a Vehicle Efficiency Market, I can imagine that the administration can stand back and allow the public to push efficiency very aggressively. As a born-and-bred Aussie, I find it hard to believe that any Australian city beats places like NYC and Boston for efficiency. Beyond that, Australia has largely adopted the 'American Model', of driving an hour to and from work, driving 500 meters to the shops, driving for small local errands, etc etc. I couldn't say where we are compared to US cities, and if I tried to get some data people would just quibble with the details as they usually do to excuse themselves for driving 500m to the shops and explain how change is impossible for them - just them. Of course there are still plenty of people with 4 tvs, 5 computers, 2 cars, a motorbike, a boat, heaps of halogen downlights, and so on. But a significant portion of the population are not as you describe. Morgan, welcome to The Oil Drum, please make yourself at home and drop by frequently. Take our suggestions in the spirit of constructive criticism. I believe your proposal is helpful, but by itself, however, far too weak to realize the level of changes needed in the US. First, sprawl and widespread development won't stop on it's own (the current credit crunch notwithstanding); proactive measures (long overdue) need to be taken to make it less desireable to live in a low density settlement pattern. The choice of vehicles would also change dramatically with higher gas taxes. And other manner and forms of transportation would increase dramatically with higher gas taxes, such as carpooling, biking, telecommuting, more extensive bus networks, etc. Second, in light of Europe's greater coastline, you haven't made the case that Europe has a majority of it's trade via inter-EU shipping. Indeed, trucking accounts for a large portion of non-rail inter-EU goods movement. The predominance of the US population lives within a relatively short distance of either a coastline or inland waterway. One point you missed is the greater fuel efficiency benefit in switching to rail in addition to maritime shipping. The most significant point you missed, however, is the need for greater relocalization of food and goods production that will reduce the need for the current unsustainable amount of movement we have grown dependent upon. Third, higher taxes would incentivize a greater utilization of the above carpooling, biking, telecommuting, and bus utilization, which simple fuel efficiency would not (indeed, it might delay the transition). And the large current inventory of existing vehicles is immune to the effects of this policy. Higher gas taxes can and should mean lower income taxes. Those who use the least gas (not just have a fuel efficient car) should be rewarded the most. I see your vehicle efficiency proposal as only one part of an approach to weaning Americans off of cheap oil. With only efficiency as a goal, there is no incentive to drive less if gas prices are still relatively low, so any reduction in gas use would be minimal, and does not address Jevon's Paradox, as low gas prices would induce some people to buy a car instead of taking mass transit, living further out than they otherwise would, etc. So your proposal, in combination with a much higher CAFE standard and higher gas taxes, would likely provide a momentous shift in American consumption of petroleum. Will it be in time to avert serious economic consequences is the question, though anything we can do to lessen the hard realities of the ruthlessly grind of declining oil production is better than pretending we can go on living pretty much the way we do now. Does that Energy Intensity of Freight Modes graph account for (or need to account for) the energy required for the infrastructure? Planes and Ships require very little infrastructure - just something at each end, whereas rail and road both require the route to actually be built and maintained. How significant are those energy costs? For rail, very little due to the long life of infrastructure. The tunnels blasted by Chinese Coolies are still in use today. Concrete ties 50 years, rail depends upon use (mainline perhaps 30 years). Shoving gravel i.e. ballast around is a primary maintenance activity for modern rail lines. Using cracked granite significantly reduces that. OTOH, asphalt is just diesel that needs a little upgrading. Cement/Concrete is rock & clay with energy added. And lifespans are shorter. I fundamentally disagree with this post. It is US exceptionalism writ large. Yes, outside of cities the wide open spaces make public mass transit less viable. However, something like 80% of US citizens live in urban areas. Park and ride schemes work well in the UK. I'm sure they could be adapted to work in suburbia-land. Those wide open spaces make the ideal blank canvas for long distance high speed rail. If crowded little Europe can build high speed rail networks I see no reason why the US could not. Containerised freight could be shipped to within two hundred miles of it's destination with only 10,000 miles of rail track laid. Transfer to a road rig, save 90% of the road distance. The key concept to get over is that tax on gas is not money removed from the economy. Put the money to good use, like paying for a national health service, and the social benefit to the poor, cash strapped end of society will be dramatic. Here in the UK we have a 200% gas tax. We still drive 10-12,000 miles a year. When the tax was introduced, cars got a lot smaller and more efficient. In the last ten years, the gas tax has been systematically eroded, and the real cost of driving has come right down. Now even the lower income groups can afford SUVs and gas guzzlers that, until the recent price hike, were the fastest growing sector of the market. I don't think anybody should advocate the little tin can death box called the Tata Nano. I certainly agree about fuel efficiency being important. I don't think moving towards cheap, dangerous, throw-away cars is the way to improve things though. Better that cars are relatively expensive, safe, and have a long lifetime. Like the Prius for example. The US has a very strange attitude to road safety. Yes, the Tata Nano probably is less safe overall than, say, the new Fiat 500 . 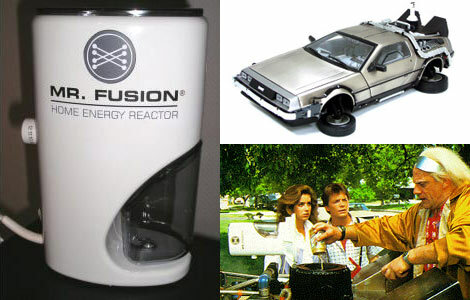 However, It will be dramatically safer than any car built 40 years ago. I learned to drive in a car which would not pass any safety tests today. I am still here. Modern cars are designed to be bullet-proof at 30mph. They are still death traps at 50mph. The best way not to get killed in a car is not to crash. That is partly down to road design and maintenance, but it is largely down to driver skill, attitude and wearing a seat belt. The accident rate in the US is far higher per mile driven than it is in the UK. We are looking at a post peak world where we have left it far too late for a smooth transition to a low energy world. We need a fast transition in the middle of depression class reecession. If the US poor cannot afford $4 gas, then they cannot afford a Prius. A Nano might be the difference between a commuting job and destitution. I'm with you on that. I'd much rather have a Nano than a big fat modern 'safe' car. I grew up in the US and got the first of many cars in about 1970.; There were plenty of wonderful small cars, mostly from Europe. My favorite was the FIAT 600 made about 10 years earlier. They were plentiful and cheap. Even with the introduction of tighter pollution restrictions in the 1970s, Honda's Kei car, the 600 was introduced and became quite popular. Subaru also had entered the US market with their two-stroke 360 in the late 1960s. Small cars have been almost totally eliminated from the US market through our unique ad hoc collection of safety regulations. The regulations have added a huge cost to the price of a car, and also have added enough weight to make a small car impractical. The Smart Fortwo (already one of the world's safest cars) was introduced here in the US recently, but the weight is hundreds of pounds heavier, and the fuel economy is laughable compared to the same model sold in Europe or Mexico because of the bizzare safety add-ons required. regulations have added a huge cost to the price of a car, and also have added enough weight to make a small car impractical. I totally agree with RalphW and Capslock. I totally disagree with MNChemE. From my POV cars are inherently unsafe both for humans, other species and the whole biosphere. They are certainly the major factor frightening the average person away from cycling. However, in recognition of the current situation, my vote would be for a national 45 mph max speed limit for all vehicles on public roads. 100 mpg min fuel consumption. Zero saftey requirements beyond the ability to steer and stop effectively and have sufficient warning lights/horns. I'd set an 8 year time frame to accomplish this. You rock,Dave. And so does your partner. Where is that, anyway? Thanks! That is D4, the road from Murs to Col de Murs in the Luberon Valley of Provence, France. One of the great cycling areas in the world, IMHO. I confess to a weakness of wanting to take our Greenspeed Tandem Trike on an airplane and fly to this wonderful spot in the world. I guess my only excuse is that we only traveled by bike once we got there. But, this last trip was a couple of years ago and I'm really conflicted about maybe squeezing in one last trip in our lives. On one hand, Aer Lingus can get us there and back with really, really cheap fares (including trike). On the other hand, since I've learned about PO, GW and all, I have great reservation about contributing to the problems just for personal enjoyment. This part of the deal is not fun! You forget pedestrians. Little social interaction on a bike, much more walking. We chased bicycles off the St. Charles streetcar tracks post-K when the streetcar was not running. bicycles are dangerous mechanical contraptions that will run over you ! (Unlike our beloved streetcars where we jog between the rails). Almost got run over by a bicyclist on a cell phone last week. Best Hopes for Progress ? OTOH, the Canal streetcar tracks in the CBD have become a bikeway. Couldn't agree more! ICE vehicles should come with big bold signs saying the owner is an ignorant greedy self centered ostentatious pig who has no regard for the commons. No, I'm not seriously expecting that to happen any time soon...disclaimer, I still own an ICE myself but at least I admit the truth. "Ride a Bike or Take a Hike"
But how many people would bike if driving is made incredibly cheap by a car like the Nano? Why take public transportation? It will certainly cost more than driving your Nano. And hey, the Nano is so cheap, why not buy one for everybody in the family? I know we already have a car for just about every driving American, but I don't think making them more available is really the answer. Plus, and I could be wrong here, I would assume that they are not built to last very long. At that cheap of a price they must have to sacrifice some quality. But who cares if it only lasts a few years? They'd be so cheap you can just buy a new one. I just think that expanding personal automotive transport by introducing cheaper cars really solves no problems. It will encourage people to keep driving even as fuel prices edge higher. More cars on the road means more congestion. I'm surprised that so many people are in favor of ultra-cheap cars. You make a very good point and it demonstrates how we really need to address the entire "car culture" of the western world (and soon to be almost the entire world). In my ideal world, by some magical means, people think about walking and biking first, then mass transit, and only limited use of small vehicles (probably electric scooters and cars) for some local activities (like when it is 20 below zero here) or for people who have physical limitations. I'd advocate removing many roadways and parking facilities as part of the deal. I'd have trains running down freeway lanes. But, as fun as it is to think about these great "solutions", the fact is that only a small percentage of the world population understands the "problem". Hence, little motivation for changing BAU. As Greenish, others, and I have commented at length, there are some very deep and fundamental reasons why the average person cannot understand what is happening. The car culture is subsidized by free parking and road construction. Take that away and cheap vehicles won't matter. I personally wouldn't mind a "death-trap" vehicle like a Nano. My normal daily driver is a 1985 Honda CRX HF, which I enjoy a lot due to its small size and great fuel economy. (Anywhere from 38-50mpg, depending on speed and conditions.) Having taken out the passenger seat, I can put 8 foot long 2x4s in it, or whatever long things I might need to transport with ease. I take it when it is cold and rainy (like today) instead of taking my motorcycle, which I very much enjoy, as it gets 70-80mpg depending on how I ride it. Plenty of people argue against older cars, but embodied energy within a vehicle has to be considered as well. There's not much point in replacing my CRX with any new car that won't recover the cost of its production in energy with the energy saved from operation compared to my CRX. This thing has 294,000 miles on it, and is still kicking. That makes for a very low cost of ownership AND low amount of energy consumed per mile when you calculate the embodied energy within the vehicles manufacture. In Tokyo, I saw lots of covered 3-wheel scooters, which seem ideal to me, and such a thing would allow me to ride a motorcycle in nasty weather. I've laid my bike over in snow before, and let me tell you that while it hurts less because of the snow, it still hurts. A Nano might be the difference between a commuting job and destitution. An E-bike or Velomobile would be even cheaper. Like the twenty five thousand dollar Prius, like the thirty thousand dollar Smart car. "LOOK --- AT --- MEEEEEEE!!!" Americans who are in economic trouble need highly efficient cheap cars and they're not interested in blaming the car when they know darn well it will most likely get them to and from what meager jobs they can hold down, and the few who whine and complain and blame the car instead of their own driving ability will simply join the die-off. It's time to adapt or die. The Nano is a car whose time has come, and for another measly thousand bucks it CAN be made safer, safe enough for the USA, a country that embraced the VW Bug, one of the worst death traps to ever grace our roadways. It can also be made electric or diesel, or even diesel-electric hybrid, for those with a penchant for fancy baubles that get really great mileage. This is nonsense in so many ways. First: My native Sweden (population density lower than that of Nevada) has good public transport. It is perfectly feasible to have good public transport in a small town, as long as people are using it, which they do if it saves them money. Second: Increasing taxes on gasoline would not necessarily be a burden. The money raised can, for example, be used to lower other taxes. Third: As just pointed out, increasing efficiency increases oil consumption. So subsidizing fuel efficient cars will not do any good. When people get more miles for their money, they will drive more, buy homes further away from work and use public transport even less. This will make it even more difficult for the US when fuel prices rise in the future. 1. I've never been to Sweden. If it is anything like Nevada (as you say) then everyone lives densely in a few cities - then of course you can have good public transportation. I am not against public transportation. I am simply offering a pragmatic and politically viable method of increasing the efficiency of the US vehicle fleet without a heavy-handed government tax. People will feel much more supportive of a VEM charge if they know that it is going directly to subsidize a more efficient vehicle and not to the government. 2. "Increasing taxes on gasoline would not necessarily be a burden. The money raised can, for example, be used to lower other taxes." Unlike Swedes, most poeple find taxes to be a burden and are very reluctant to rely on government to decide how best taxes are spent. Many also feel that only a small portion of gasoline taxes raised goes to improving public transportation or other efficiency. A gasoline tax is not politically viable in the US - and with that as a starting point, I have tried to come up with an alternative to achieve the same goal. 3. "When people get more miles for their money, they will drive more, buy homes further away from work and use public transport even less." You assume that oil consumers have a constant transport budget and will not use efficiency savings to spend/save for non-transport items. This may be the case for some oil consumers - but there will be many people that will not use efficiency gains savings to drive more. Net efficiency should improve. my family will unequivocally not ride the bus. chalk it down to all the meth-heads (and their lookalikes) around here. I meet New Orleans only billionaire (since passed) Pat Taylor several times on the streetcar. Meth-heads? Do you live in Oklahoma? As an urban planner, I concur with Per -- the US is, in terms of urbanism, not so special. As far as density, Colorado (population around four million) is about as dense as Sweden -- and has a similar urban configuration. The population of Colorado lives along corridors and in metro areas. The rest of the territory is empty. This configuration is actually fairly easy to serve with public transportation. The reality is that the USA is far more urban today than we were in decades past, when our oil consumption was lower. While you could argue that European settlement patterns are slightly more pedestrian friendly, the urban form is not so different as to account for the gulf in personal driving habits. 1. If fuel prices were higher, people would adjust their behavior. 2. You could simply pay people to use public transport. Crazy? Hardly. We already do. Say the average transit customer gets a $1.50 subsidy in a particular American city. Simply increase the subsidy and you could afford to issue rebates to customers. You would operate the program in bulk- subscribe in thousand-ride blocks. Gradually, over time, you would change the culture and the infrastructure and you could wean people off the higher subsidy. Most of the transit ridership is based on habit. You can "hook" your customers. 3. Have a sidewalk and pedestrian blitz in construction to coincide with a blitz in constructing BRT. The supply will create some of its demand. 4. Reorganize transit systems as a "grid" or "network" as opposed to a "hub" system. 5. Get serious about land use. Put your jobs at rail stations. Have day care, groceries, etc. available at the transit hub. I have been living in America without a car, but using carshare, for several years, despite having a child and a very busy schedule. It is surprisingly easy in many metro areas (but not those with poor transit networks or without carshare). Of course, I fly a lot, so my fuel consumption is still not great. Give me trains, though, and I could do without flying. Your proposal sounds like Amory Lovins' feebate; reward higher mpg; punish lower mpg. Fine as far as it goes, albeit it does nothing to wean Americans off excessive use of the automobile. It also takes a long time to have much effect as the it takes a long time to replace the existing fleet. Also, as pointed out on another post here, it does not address the inefficiency of used vehicles. If one is going to have a feebate, combine it with a rationing system whereby people can trade gasoline credits in a market set up to do so. We trade everything else, so should not be a problem. The frugal will be doubly rewarded while the non frugal will be doubly penalized. Overarching all this should be a long term plan to make auto use less necessary or unnecessary through auto free zones and cities combined with transit. This, of course, will require more concentrated urban populations. As long as gas prices are kept low, suburbs will rule. Regardless, it is always possible that the market will cause very high prices anyway. But I don't think we have time to wait for the magic of the market. In any event, the market is too volatile as we have discovered in the last year. Look at all those fuel efficient cars on auto lots around the country. But then we are all just blowin' in the wind, aren't we. Nothing that any politician does will threaten the sacred status of the auto or the shibboleth that the poor will suffer. I'm afraid I'm going to have to join the growing corus of voices rubbishing the article. The reason oil consumption in the US is double that in Europe is not population density, coastline or car ownership, it's because of built infrastructure and consumer habit. And a lot of the latter continues thanks to the cheapness of gasoline in the US because of low taxes. Sometimes, even if an idea doesn't solve the whole problem, it can be a worthwhile contribution to a broader approach, or it can be used with some modifications. If the solution to the high US oil usage were easy, I think the problem would have been long solved. We need to look at this suggestion from the point of what helpful it may add to the discussion. TheWatcher: You seem to agree with me (except for your first comment). I agree that "infrastructure and habit" helped facilitate the low population density and widespread car ownership in the US. This is why oil consumption is higher in the US than Europe. I don't see why this invalidates the Vehicle Efficiency Market idea? With any of these proposals, the devil is in the details. It seems like if a proposal like this were actually implemented, it would need to be structured in some way so it doesn't hit US auto companies too hard. If the effect is to put GM, Ford, and Chrysler out of business, this would be an economic problem. Gail -- I agree that implementation of your approach would perhaps be too much for our political system to handle. Special interest would almost certainly control the debate. Otherwise it does have some merit IMHO. As far as the various criticisms of your proposal I've seen nothing else offered which has any viability. The USA will not change its approach to mass transit to any significant degree anytime soon. Nor are we going to change the distribution pattern of American domiciles. Not that these approaches couldn't work if implemented. None of these ideas will work because the economy lacks the capital to do it. I don't care to waste time going into the scalability issues of all the nice little fantasies of how we can fix our system. We've chatted them to death here already. But please don't hesitate to offer any alternative approaches. But it would be nice if everyone included the full scale cost and timing of their solutions and the source of revenue to institute the same. If the effect is to put GM, Ford, and Chrysler out of business, this would be an economic problem. Here we have the horns of the dilemma; if we don't shift to dramatically lower fuel consumption, with highly fuel efficient vehicles being part of that equation, we suffer dire consequences ala Hirsch Report. If we do shift to highly fuel efficient vehicles, the US automakers suffer. I believe the former is essential no matter what; if the US automakers understand the restructuring that's required to mitigate PO, one or more will pull through in one form or other. If they don't, they will go out of business regardless. The executives are not rewarded for long term thinking, however. So... If I were to drive 50 miles per day to my job in my 50 MPG vehicle, is that better than going 2 miles in my 20 MPG vehicle? 1) Encourages lower use of fuel by everyone. Even though I have a vehicle that gets 50 MPG, I may want to carpool on my ride to work and sell that extra voucher for a gallon of gas to someone. 2) Discourages use by those who consume more fuel, and forces them to be more efficient. For instance, it will cost much more to drive a Hummer to work if one has to both buy gasoline and then buy vouchers for gasoline above and beyond 10 gal/week. This brings in the invisible hand of the market, and uses the market to reward/punish vehicle efficiency (or inefficiency). And just how long do you think it would take for large numbers of people to start making ethyl alcohol and biodiesel at home? Make gasoline too expensive and people WILL find a (perhaps unpleasant) way around it. Why not just let nature take its course? Let people buy what they want, live where they want and when oil becomes scarcer and higher cost let the chips fall where they will. We know higher prices are coming sooner rather than later, so why not just let things happen. I am all for every possible effort to EDUCATE people on the effects of peak oil, but will fight against (like most people in the USA) the efforts of a small bunch of know-it-alls trying to control our lives. People who are willing to give up individual freedom for collective security will wind up with neither. It's unbelievable how there still appears to be so much optimism. That efficient personal transport is needed to replace the transport we have now. All I ask is why,why why why why. Is there an expectation of them facilitating even a modicum of BAU? What is the short term expectation, what is the long term expectation, even beyond five years? What is the plan if an economic collapse affects the supply of fuel and food. The very, simple answer is what will happen will happen. If we have enough fuel and business is booming and it requires a more efficient vehicle to enable a profitable enterprise, then it will happen naturally. Trying to put the cart in front of the horse won't cut it. Even for public transport if it's needed it will happen. Efficiencies evolve out of necessity. They evolve where they are needed and where it is good business sense to do so. Forcing it, is a pipe dream. Many a business decision has failed by trying to tell customers what they want. You sell what is in demand and be able to alter the model as expectations change. The political and economic climate change constantly. Like our standard understanding of evolution, businesses unable to respond and adapt to change end like the dinosaurs and other evolutionary dead ends of the past. The perceptions of the populace will dictate the path which is chosen. The perceptions can be influenced but don't expect the influence to drive more than a fifty percent desired outcome. As the brilliant Jim Stockdale said when he was released from captivity. "Those that did not survive were the optimists". Don't expect technology to be the answer. Expect things to get worse, expect to be in it for the long haul, toughen up and prepare for disappointments. Had the same thoughts myself.... i really can not see why this wouldn't work... the vouchers could work independently of the market oil price.. so the pump price has nothing directly to do with the voucher price. heavy users would be paying a double whammy to access extra vouchers..
extend the scheme so the vouchers are carbon credits and it ties the whole fossil fuel end of the spectrum up.. could even throw in that climate change stuff for branding purposes. I think that vouchers could be one component of a rational solution for the next few years until we overhaul personal transportation systems. But, As a bicyclist, I would hate to see that being the total solution. I can easily see some wealthy SOB buying as many vouchers as he pleases to roar around in his Hummer and endanger cyclist, pedestrians, and little electric vehicles. I think there must be many other restrictions on our car culture. "So... If I were to drive 50 miles per day to my job in my 50 MPG vehicle, is that better than going 2 miles in my 20 MPG vehicle?" 2 miles X 5 work days for 10 miles so 20MPG/10miles equal 1/2 gallon consumed. I think you guys are making this all harder than it is. I recently went from driving just over 44 miles round trip to work 5 days per week down to driving about 3.4 miles to work 5 days per week, and the reduced fuel consumption has been astounding. I did not relocate due to fuel cost, which were givaway cheap compared to my current rent and city expenses, but due to the massive Kentucky ice storm driving me out of home by destroying both the electric power to my house and bursting my plumbing all in one night. I now live in a dog kennel of an apartment, and cannot afford a house comparable to the one I was in (admittedly something of an old worn out dump)because house prices in central Kentucky are still idiotically expensive. I live far less humanely now, and save no money doing it, but my oil consumption has crashed through the floor. I now know to the bottom of my heart why the American people chose the suburbs and small towns. Ill designed suburbs are wasteful. Ill designed and oppressive cities are hell. Most people assume that Europeans consume less oil because of high taxes. I see it the other way around, Europeans can tolerate high taxes politically because their oil consumption patterns are fundamentally different. I grew up in Europe and I feel I have a good understanding of consumption patterns there. I also believe oil consumption data for many countries supports my argument (I will post a chart supporting this shortly). A gasoline tax has never been politically viable in the U.S. Why do you think that is the case in the US, but not in Europe? It is because US consumption patterns are fundamentally different. A gasoline tax is (and has always been) easier to impose in Europe because less people consume oil because of where they live. One can effectively pay people to change their oil consumption patterns and a Vehicle Efficiency Market in the US would do that. A Vehicle Efficiency Market would reward efficiency in a politically acceptable manner and achieve precisely the same goal as a gasoline tax. Interesting efficiency-related announcement by the U.S. Administration today: US mileage standards for cars up for first time. It almost sounds like you're suggesting that we don't have a gas tax in the US. Gas tax is actually fairly substantial in some states ($0.671 per gallon in California). You might like to do some research before claiming $0.671 per gallon is "substantial" - compared to rates in Europe of over $3.50 per gallon. Substantial compared to other American taxes. In Minnesota we pay about 7% sales tax, maybe 20% income tax (depending heavily on income), 9% alcohol tax, 0% clothing tax. Lately gas tax has been approximately 30%. That makes it comparatively significant. I am aware that it is far far far lower than what practically any other industrialized nation pays. I am certainly in favor of increasing it. I also believe oil consumption data for many countries supports my argument (I will post a chart supporting this shortly). It will show how we got where we are (i.e., overweight people eat more than others) and focuses more on BAU; it won't show or project where we could be. Is there a difference in the US vs. EU consumption mindset? Yes, because while the landmass of Europe was constrained over the last few hundred years, the US was increasing in size and had seemingly unlimited resources, so a "we have no limits" mindset was formed. Refactoring that mindset is what is required. You've basically restated your thesis statement and say that you believe you are right; why not address the counterpoints directly and in depth? It would help if you projected what the US oil consumption change would take place with your proposal and gave a thorough explanation of your assumptions. Then you might see the effect the used car fleet has on demand, for example. I don't think the US should subsidize the purchase of ANY car, no matter how 'efficient' because the idea of personal cars is quickly becoming an anachronism. Taxes on new cars and fuel should be directed toward subsidizing the build up of public transportation. I thought I was tall, Morgan Downey is HUGE! Thanks Nate. I was waiting for someone to comment on the photo. To give you scale for the photo: I am 6'3". According to wikipedia, the average american male is only 1 centimeter taller than the average French male. (though the studies did not segregate by weight, nor by blue eyes). So what the head and leg room like in your ride? The vehicle in the picture is not mine. It is one I saw while visiting Paris in 2008. Off topic: what I thought most unusual about that particular vehicle (apart from its obvious comically small size for a 6’3” person like me) was how nobody ‘tagged’ the door with graffiti. It is almost as if that would have been crossing some sort of personal boundary and reinforces my strong belief that common civility is generally innate around the world. "Oil 101" eh? Well here's economics 101. Anything cheap or free is wasted. When I see SUV's outselling regular cars, that means oil is too cheap and is being wasted. When we see mainly small, fuel-efficient cars on the road them maybe the price is right. Case closed. Go get some business education and good luck on selling the book. This audience is probably ripe for picking, as you no doubt concluded yourself. "Anything cheap or free is wasted." I agree completely. Currently, because of relatively low oil prices in the US, efficiency gains are being wasted on large heavy vehicles. A Vehicle Efficiency Market would put a steep price on efficiency and ensure that it is not wasted. Consumers would pay or receive a cash amount depending on whether the vehicle purchased was under or over the average miles-per-gallon (MPG) balancing point for the prior month. The further a vehicle is from the average MPG, the higher the cash payment or credit. Follow the logic to its conclusion: A bus pass or a bicycle as sole transport should give the holder a far greater rebate than the most efficient automobile manufactured. This would remove the pro-consumption and class bias of the project, where only those who can afford to purchase a car benefit from the scheme, and would encourage people to move into cities where transit is an option -- the rebate would offset some of the higher rents of a walkable/bikeable/transit lifestyle. Thanks for the links - this is really interesting. So, how do we get our extreme car culture to both allow these kinds of vehicles on public roads AND prevent SUVs, Hummers and the like from smashing into them. I would love to see these types of vehicles as the normal mode of personal transportation. Maybe sponsor events/races ?? education ?? This is a lot more fun than NASCAR! I like Morgan Downey's idea. It will not solve our oil problem, but it is a step in the right direction. And it fits in nicely with the American tendency to remedy problems though the tax code. It is the tax code that is part of the reason for so many large pickups in the fleet. These vehicles are frequently purchased by small business owners and farmers who write their costs off against income. It has been my observation that these gas guzzlers often carry little or no cargo and only one occupant. But since the benefit of a tax write off is available to the owner the expense is not as high as it looks on the surface. In contrast the purchaser of a fuel efficient small vehicle is likely to not be able to write it off as an expense because he does not have a business and probably works for someone else. Downey's idea would level the tax code "playing field" to some extent. It would reward those who are not being rewarded now for making responsible travel choices. And it should be revenue neutral if the scheme is set up such that payouts have to match collections. As it is now, pickup trucks and low mileage vehicles are de facto subsidized since they are more likely to be purchased by those who can deduct them as a business expense. I am one of them and that is the main reason I buy pickup trucks (small) instead of another car. The other reason is that trucks hold their value better than cars. The truck tax benefits are greater than the gas savings of a small vehicle that is not deductible. I know because I have both. To my point that North American oil consumption patterns are fundamentally different because of where people live, below is a chart (from Oil 101) which shows how oil consumption around the world tends to eventually settle into two distinct areas. What a Vehicle Efficiency Market (VEM) would do is to pay people to change where and how they live in the US. This is the only way to shift the US down to European level consumption levels. Europe and other areas could of course also implement such a VEM in addition to their current taxes. You can create change with a tax (which, unlike Europe, is not politically viable in the US) or put a price on, and incentivise, efficiency independent of oil prices - which is what a VEM would do. That straight line on the graph is a mile away from a least squares best fit. The country with historically the highest gas taxes is the UK. The country with the highest GDP per barrel of oil consumed is the UK. and since when was Australia high density? The UK is not the country with historically the highest gasoline taxes. Many other European countries (Norway for example) have higher gasoline taxes. I can assure yout that the least squares line was plotted correctly. I don't want to get hung up on the "line". The data points should be pretty clear in themselves. When I talk about population density, I am generally referring to how closely people live to cities and how dense those cities are. For example, I would consider Australia to have a somewhat high population density even though it is a country with a large landmass - as most poeple live very close to a few cities. Norway isn't a datum on the graph. If it was, it would show a GDP of about $55,000 per capita and an oil consumption of about 16 barrels per year. It would not fit in your "high density high GDP" bubble. There are far too many factors affecting national per capita oil consumption to draw the conclusion you come to. I think the pattern is very clear. I chose not to include countries with very small populations (such as Norway ~4 million, Singapore ~4million) and large oil industries as they are very different from large population countries (greater than 50million people) with the oil industry not overwhelming the economy. When I talk about population density, I am generally referring to how closely people live to cities and how dense those cities are. That removes a lot of the difference between the US and other regions, though. If you exclude Paris, France's urban areas have a population-weighted density of 3,000 per square mile, which is much the same as the USA's large urban areas (>500k, 2,900 per square mile; note that France's large urban areas - sans Paris - average 3,200/sqmi). And yet France, even outside of Paris, has much lower oil consumption. Most Americans - about 80% - live in urban areas, and similarly-dense urban areas in other rich nations have shown that they can live well with much lower oil consumption. It's simply false to say America can't do the same. For example, I would consider Australia to have a somewhat high population density even though it is a country with a large landmass - as most poeple live very close to a few cities. Urban areas in Australia are slightly less dense than those in the USA (p.89). It's not clear what the numerical basis behind your classification scheme is. Obviously you haven't had much,if any, experience of Australian cities. That was not your argument in the article. The USA is not inherently different from the EU. With proper gov't incentives (which is what created Suburbia), we could have comparable (or higher) densities to the EU by the time that 99.5% of the vehicles on the road today wore out. Stop building new roads, reduce maintenance on existing roads except in high density areas (reduce all interstates to 4 lanes & eliminate many), high gas taxes, spend $250 to $500 billion on inter-city railroads and $60 billion/year on Urban Rail. Tax parking spaces (raise those taxes every year), add a risk premium of 1% to the mortgage interest rate of every house not within 3 miles of Urban Rail and 0.5% if not within 1 mile. Repeal "red lining" laws for Suburbia (used to be that one simply could not get a mortgage in an inner city (a red line around them on the map at the mortgage company), which helped destroy them. After the fact, anti-red lining laws were passed. Just apply the laws that created Suburbia to destroying it. Allow mortgage companies to put "red lines" around any Suburb built after, say, 1965. Then sit back and watch Urban density climb. Around 70% of us live in cities of more than 100K people. 90% live in cities or towns near the coast. - Early European settlement was via tall ships into areas with easily accessible harbours, good soil and rainfall. - Most of the continent is uninhabitable (unless you are a hunter gatherer with 40,000+ years of accumulated survival skills). The older parts of cities are also especially dense because our standards of living were low prior to WW2. Hence our houses were smaller and built closely to together to allow the working classes to live near the city centre (especially in Sydney). Sadly, we've generally followed the planning approaches of the USA since the 50s. The difference is quite stark. In my home city if you live north of the port, you live in areas that were settled prior to WW2 and there are double track, heavy rail stations every 1-2 km. If you live south of the port you have a single track with stations every 3-7 km. Most of these stations are at the edge of urban areas with no connecting paths or buses to commercial centres. The density of suburbs built after about 1914 is very similar lots 20X50m to suburbs built in last 10-20 years. For example Mortdale, Hurstville all built before WWII. Hoxton Park, West Hoxton was just built 2 years ago, lots are 15X30 m smaller than pre-WWII but still open spaces between subdivisions. To find smaller lots have to go to suburbs built about 1900-1910 or earlier(Leicthart, Glebe). Many of these lots are 7x35-50m about 1/3 area or 1/2 including roads. Often factories were interspersed with residential areas, workers walked to work, food was purchased on foot at corner stores. These areas were serviced by tram lines. The car has enabled town planning to separate residences from factories, and also have green spaces along creeks, etc separating high density subdivisions. Add to this the need or desire for many households to have 2 incomes, so at least one has to travel perhaps 10-50 kms, plus shops now 5km away even expensive corner stores 1-2 km. The suburban lot size is not the problem it's the way society functions now compared with even after WWII, few can function with mass transit unless both working parents happen to live on a bus or train line and work on a bus or train line and it doesn't involve 4-5 transfers. If each household had just one person working out of home families could live closer to employment, but would have to be satisfied with using local school, allowing children to walk, using local shops, and walking 1-2 km, not going to restaurants or being satisfied with the one local all the time. Most of us are not willing to voluntarily go back to 1910 life-style; the economics of small factories small retail outlets, low cost of labor, walk to tram lines, one working spouse,etc etc, when we have a better future alternative, a PHEV or EV. We could cut down the green-spaces to increase density but it's not going to help, just increase traffic density. Look at inner city, people still drive around even if some use mass transit to go to work, others drive to edge of city to work( 2hours by mass transit, 30 mins by car going against peak traffic). a chart (from Oil 101) which shows how oil consumption around the world tends to eventually settle into two distinct areas. Actually, there are 3 distinct areas, with the lower left being the third. This can be interpreted to show how gas consumption is higher in countries with low gas taxes, which counters the point you are trying to make. You make this assertion, but don't support it, especially with regard to policies which would use the gas tax revenues to offset income tax. Please address the points I and others have made, vice continuing to repeat your thesis statement. "This can be interpreted to show how gas consumption is higher in countries with low gas taxes, which counters the point you are trying to make." - I agree that consumption is higher in countries with low gas taxes. However, I am trying to make the point that such taxes are politically viable only in population-dense countries. "You can create change with a tax (which, unlike Europe, is not politically viable in the US). You make this assertion, but don't support it, especially with regard to policies which would use the gas tax revenues to offset income tax." - The lack of political viability for a US gasoline tax is apparent. Europe has high gasoline taxes, the US does not. US voters have chosen over the years not to vote for any major government tax on gasoline. I doubt any US politician would propose any sort of gasoline tax - especially not in the middle of a recession. - The beauty of a VEM is that the government's mitts never get on the money. VEM payments/credits would be a clean transfer to support the goal of efficiency directly. I feel that many European governments use their gasoline taxes as a pool of funding for general budget purposes - with only a portion going to public transportation and other efficiency projects. The lack of political viability for a US gasoline tax is apparent. Europe has high gasoline taxes, the US does not. US voters have chosen over the years not to vote for any major government tax on gasoline. I doubt any US politician would propose any sort of gasoline tax - especially not in the middle of a recession. But you haven't addressed a revenue-neutral gas tax, where income taxes are lowered by the same amount. Note that the candidates that proposed a 'gas-tax holiday' did not get elected, so your assumptions about gas taxes are *not* 'apparent' in today's climate. "But you haven't addressed a revenue-neutral gas tax, where income taxes are lowered by the same amount." That puts a lot of faith in the government to spend gasoline taxes on lowering income taxes. Gasoline taxes just become yet another tax piling onto the existing taxes. I believe gas taxes are just too hard a sell. People in the US have not voted for them in the past because the living patterns in the US demand much higher oil consumption (compared to Europe). The gas tax holiday proposed in the recent US predidential election was pure short-term headline grabbing desperation and I think most voters saw it that way. People believe in clean, simple cash transfers. You buy an efficiency vehicle and get a cash amount directly from the buyer of an inefficient vehicle - Vehicle Efficiency Market. Simple. Both of our proposals would collect money taxes people and pay it back out. Both are revenue neutral. Both require the same amount of faith in the government to get their rebate back. Your proposal would not be a direct transfer of cash from one buyer to another (this would also assume exactly the same number of taxed vehicles sold as incentivized ones. The American public is now much more aware of issues like Peak Oil, hence were not impressed with "gas tax holidays" that some politicians incorrectly assumed would strike a chord with them. So I don't believe your basic premise (that most Americans would be opposed to a revenue neutral gas tax) is valid any longer. However, I would be in favor of both approaches being used concurrently. Great post, even if most do not agree with your idea. Australia may have a low population density (1/15th of US) but 80% live in the largest cities and the urban density is much higher than many US cities, but lower than New York(more in line with European). A post a few months ago showed VMT/urban density in world cities that would probably match up better to barrels oil use. We are not going to change urban density for 50-100 years, so we have to live with more VMT in US, high sales taxes on gas guzzlers,, CAFE standards like Europe is planning in 2010( 50 mpg average?) are needed. I think you have made a good point about what will work, clearly 200% gasoline taxes are not going to work. Imagine a presidential or senate candidate running on $3 a gallon tax!, Europeans accepted oil taxes before they had their own. The US will only incrementally creep up gas taxes. The USA, in just twenty years (1950-1970) dramatically lowered density, trashed (almost without exception) ALL prime commercial property (crica 1950) called "downtowns" and many well built established neighborhoods (called "inner cities") as well as destroying or dramatically shrinking non-car transportation options. Why not 20 years in reverse ? What happened in Sydney's urban core was that factories moved out to city fringe, often consolidating into larger operations requiring space, for example flour mills, food processing, also warehouses that once served urban department stores had to be close, now with express-ways could be on the edge of the city, and finally retail stores moved out to suburban shopping malls usually built away from rail lines because land was cheaper and needed cheap land for those acres of free parking. They were also closer to suburban consumers easier to drive than hauling that strollers onto a bus or train, parking was free, unlike stores at suburban rail stations, so women shopped "locally" at Westfield developments. If a city has a high population growth rate the density can be increased by changing zoning regulations allowing "in filling" of suburban blocks. Rebuilding core areas to have higher density living requires new people to move either from suburbs( lowers density) or from somewhere else, ( lowers density in small towns), so little advantage. Population moving from semi-rural( hobby farms and doomer retreats) would help if those farms were consolidated into larger operations. We could start to totally dismantle suburbs, but a simpler solution is to move to EV and PHEV's, transport at least to rail stations, have to replace the cars every 20 years anyway, can keep massive investment in existing homes, rather than building new high rises and suburban dismantling. Rail can be very efficient if a limited number of stations with drive and ride. The problem in US is at the other end, many jobs have been located at edge of city(factories) or retail(Wal-mart type developments). It would not help if everyone lives in urban center but have to commute to city edge each day( just reverse traffic flow) In 50 years industries could be re-located to rail, not express-ways. Starting to move more freight to rail now would accelerate this process, so that the logical choice for a factory shopping mall, etc would be on the rail-line not a major interstate. Looking at most European cities with a lot better rail, still lots of VMT by auto commuters, so we are going to need to continue to have private vehicles, even if we can dramatically increase city density. The exceptions are New York, Venice, and a few other cities, basically ban private vehicles. Yet Sydney's per capita oil use is less than NYC. *ALL* Aussie cities listed )Sydney, Melbourne, Perth, Adelaide) were above EU cities but below NYC. NYC does not "basically ban private vehicles" even in Manhattan. Parking is restricted in Manhattan, but Manhattan has only about a fourth of NYC residents. PLENTY of driving in Queens & Staten Island etc. VMT for New Orleans residents (pre-K) was tied with NYC residents (Suburbanites driving in excluded in both cases). I'm not so sure about the differences between the US and Europe. Here in Europe, without gas taxes, circulation taxes, plates taxes, the new (proposal) SUV taxes and so on, many people I know (maybe most)would be happily showing off 2 tonnes SUVs. No matter if they'd use them only to go to the bakery 400 metres from their homes. So I think the taxes are clearly doing their job curtailing the same consumption patterns as you have in the US. By the way, the high tax on gas is something historical (I´m around 30 and it was there since I remember), right now it would be really, really difficult to raise the gas taxes (here in Spain there was almost a revolt about 1 eurocent tax raise), again he same as in the US. P.S: in the case of Spain the central government gets a tax on plates when you buy the car and the local government a tax on circulation every year. I know that, more or less, the tax burden is pretty similar all accross the EU. Cars, not people, eat gas. Another way is for individuals to decide what cars to buy based on the total cost(present value), but that depends on the price of gasoline. With super-efficient cars(70 mpg), the price of gasoline as almost no effect on the total cost. what would the maximum price of a mass transit ticket have to be over the 15 year life of the car? It would be zero: $55,200 + ticket =$55,200. I have never seen free mass transit in my life, usually it's around a couple bucks for a few miles. If you drove your 20 mpg car, 3000 miles per year and took mass transit for 9000 miles per year then the price of the ticket would have to be ~5.6 per mile ($50160-$42600)/135000miles. You could buy a 40 mpg car or get rid of your car and take mass transit all the time. In that case the cost of a ticket per mile would be $55200/180000 miles or 30.6 cents per mile which is about what a mass transit ticket costs per mile. In other words mass transit might work economically if people completely got rid of their cars AND there were no infrastructure costs. High prices for gasoline don't drive people to mass transit, inefficient cars and congestion does. And parking, at least for downtown cores. Driving 30k to work for me is about half the price of transit (assuming I'm going to own and insure a vehicle anyway), except for the parking (with Canadian gas taxes, which are higher than the US, albeit nothing like Europe). And I can read on the train instead of sitting in traffic, although even with congestion driving is almost always faster than transit. Transit has it's own congestion problems in the form of packed trains, every day, which makes traveling in them uncomfortable. along with frequent service problems that cause extra delays and inconvenience. I'd talk about buses, except that on most routes they're so unpredictable and crowded that I don't bother - if I couldn't walk to the light rail station I would definitely drive to work every day. Thankfully, I chose to live somewhere I could do that. I'm not entirely convinced that the Jevon's Paradox acts only as a function of price (ie. greater efficiency drops the price so we buy more) but also because if something is more efficient, then it produces more value of something for a given input- therefore it is more worthwhile to do that thing, even if the price of the input stayed the same, or even rose. So people might buy the efficient car but drive further in the Vehicle Efficiency Market. I think it's a good idea, but is only part of the solution. 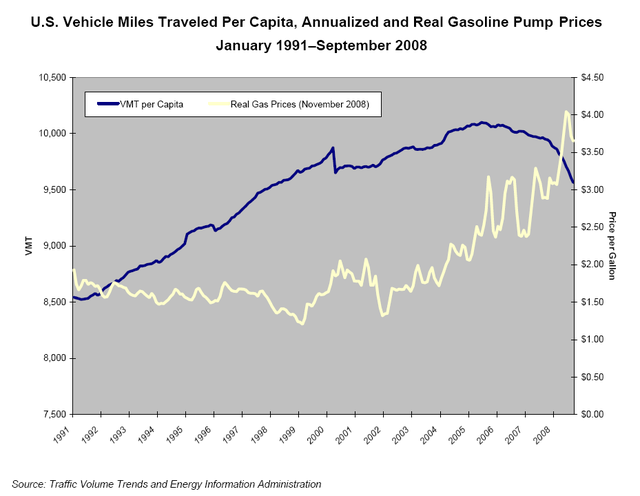 Miles driven per capita is remarkably stable over time and a range oil oil prices (2008 was exception in its decline). It makes sense that this is the case as we are creatures of habit and drive to/from work/school every day with little room for variation. Because of this, I don't feel the national vehicle fleet would be driven more if the fleet simply becomes more efficient. I've just found data from the US on Vehicle miles travelled per capita, and I disagree that they remain constant over time. They have been rising (with the exception of the two oil crises and WWII)since 1935 (I have data 1935-1995, but I don't know how to post it). People and companies obviously do change their habits over time to drive more, and this could also happen with an increasingly efficient vehicle fleet. VMT has kept growing as "density" for the USA has grown (and congestion, i.e. the time cost of VMT, increases). A two year old TOD article. IT IS THE URBAN FORM THAT DRIVES US TO DRIVING !! My goal last year was 60 gallons, I used 74 gallons of diesel in my 1982 M-B 240D (manual transmission & window winders :-). Absent accidents, my last car. I could drive a Hummer and use less gas than most Prius owners. Wrong solution to the wrong problem. I believe he said Miles driven "per capita". Population is not constant. How would that change your chart? The steady increase is similar to the raw VMT graph; the tipping point seems to come at $3.25/gallon gasoline. Now gas is back down to $2.00/gallon and people have been economizing, but the trend will turn up again if gas stays at this level for a while. Great graph, but doubt the tipping point is $3.25/gallon, most other high GDP countries pay and use fuel at $6-$10 a gallon, it's still inexpensive. Other costs, depreciation, maintenance, registration still high and if you have a high mpg vehicle, cost does not change very much even at $6 a gallon. The tipping point was the sub-prime induced recession, when did fuel prices start to drop? about the time Bear Stern went under. The graph is for the U.S., not other high GDP countries. 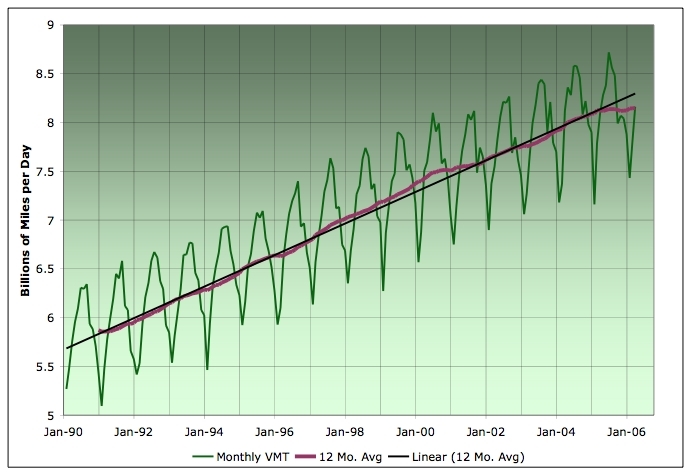 VMT per capita in the U.S. hit a peak in January 2005; the Bear Stearns collapse was in June 2007. Hochwarter gleaned the information by surveying more than 800 full-time employees this spring  when gas prices hovered at about $3.50 per gallon. All of the people surveyed work in a wide range of occupations, primarily in the southeastern United States. All drove personal transportation to work and had an average commute of 15 miles each way. Search the literature on gas prices and you'll see endless references to "psychological" barriers: $2.00/gallon, $4.00/gallon, $100/barrel, etc. In many cases it's not the actual price that shocks people, it's the relative rate of increase. The fact that most Americans are locked into a lifestyle of automobile dependency with no alternatives tends to exacerbate the unease. "The graph is for the U.S., not other high GDP countries. VMT per capita in the U.S. hit a peak in January 2005; the Bear Stearns collapse was in June 2007." My point was that fuel PRICES started to drop at end of June 2008( when Bear Stern collapsed), VMT took a CRASH dive then (not in 2007), so although prices were dropping, VMT were dropping faster!, conclusion: Financial tipping point( peak of subprime loans), NOT gasoline price tipping point. After this recession we may well see how high gasoline prices can go before US consumers cut back in a major way, my guess is >$10/gallon based on what people with lower incomes than US pay in other countries. If its a gradual increase, people will switch to higher mpg vehicles so price can go even higher before VMT crash, perhaps $20/gallon if CAFE standards are increase average fuel economy to 50mpg. People driving PHEV's getting >100mpg won't even notice $10/gallon prices. People driving 100 mpg PHEVs are exactly the ones who are most concerned about gas prices, fuel scarcity and vehicle efficiency. US population growth is about 0.9%/year, Over 14 years, this increases 5.7 billion miles/day to 6.4 billion miles/day (rough read of chart). Simons is a well respected investment advisor to the petroleum industry. --Europeans drive a lot. Highways are very crowded. But they drive more efficient vehicles. --Jeavons paradox doesn't apply to an economy in recession or permanent decline, which is where our economy is at. Efficiency can only lead to additional consumption when consumers have the money. The goal of a VEM is to separate efficiency from oil prices and economic cycles so that even if consumers have less/aditional money to spend on oil, they have a constant cash incentive to buy a more efficient vehicle. Jevon's Paradox doesn't mean that. It's not a catch-all for people using more resources. In particular, it has nothing to do with consumer response to falling oil prices. Fundamentally, it's nothing more than a statement about the price elasticity of demand for energy. These days everyone seems to be using Jevon's paradox interchangeably with the rebound effect. Seeing a rebound greater than 100%, in other words Jevon's paradox, is incredibly rare. So much so that we haven't seen it in decades in the U.S. AFAIK. Jevons' will probably still apply as a share of total use even if economy (and production) is dropping. Those who have most efficient equipment can increase market share as others go under, possibly increasing their absolute use, but at least increasing their use relative to others. It is useful to continue consumption of fuel for the longest time if you have the most efficient vehicle. Increasing use relative to the drop in efficiency isn't Jevons' paradox, however it is the rebound effect. In other words, if efficiency improvements drop consumption by 10%, and increased use offsets that by 5%, we will see a 50% rebound. A rebound greater than 100% is what's referred to as Jevons' paradox, and hasn't been seen in decades in the U.S. Most rebound effects are from ~0-40% IIRC. Thanks, I wasn't using the term correctly-I've looked Jevons' and rebound up now. That most rebound effects are 0-40%- is that the direct rebound effect, or does it also include indirect effects and the effect on the greater economy? The text of the article includes indirect effects, but I'm not sure if the papers surveyed all include indirect increases in energy use associated with an increase in other behaviors. Even if indirect increases weren't included, we aren't looking at a huge increase above the cited figures. For instance lets say that the increase in driving miles also increases purchases, even if some efficiency drop results in an overall decrease in fuel consumption. The fuel needed for production and transportation of whatever consumer product tends to be a lot lower than what's used in personal transportation because industry is way more efficient. A diesel semi may only get 5-8mpg, but since it's also hauling 30,000-50,000lbs, the amount of fuel needed for any possible increase in spending as a result of more driving tends to be very, very small. Freight by water and rail are even more efficient. We could say that's it's maximal for very fuel intensive stuff, for instance hauling rock, but even then the driver still has to be paid, the compay paid, and the owner of the rock paid, so we still aren't buying as much fuel indirectly as we would be if all that money went towards fuel. Keep and slightly increase the Federal Gasoline Tax for debt servicing (plus ax a few wars, a few unconstituional powers, a few unnecessary federal departments), stop all Federal subsidies for the Interstate Highways, sell them off to private investors as toll roads. Let them compete our flounder as they wish. City streets and access roads can be maintained by local governments. Anyone ever heard of a Trolley?? The Problem was caused by indirect Government subsidies to Car/Truck/Air companies by building tax and public debt supported infrastructure. Not to mention our tax code and Freddie and Fannie. China is financing our highways and OPEC is financing our oil tanks. Remove government intervention and the only profitable enterprises would be the most efficient: trains and waterways, and location would take on an even more important role in real estate. Port infrastructure is cheap on a per ton basis and is naturally maintained in places like NYC. Occassional dredging is all that may be needed. Government intervention, as good as its intentions may be, always has unintended consequences that always seems to call for another Government intervention for a remedy. We need to free ourselves of this mindset. Save the world- buy (a portion of) a rail company. "stop all Federal subsidies for the Interstate Highways, sell them off to private investors as toll roads." You can't actually believe that this is a good idea. Somebody could buy a small section of a highway and charge an enormous fee, then what choice would people have? Offroad it for a few miles? I can't imagine that privatizing highways could ever be a legitimate solution to anything. Unfortunately Government action has created this situation where the first question asked is- well where will I drive my car?? Perhaps in its dying moment the Government can fix the problem it created by warning its citizens that it will be cutting its life support for the highway system. Perhaps intercity travel would be viewed as the luxury it is. A private intercity passenger train company starts to look profitable when it isn't competing against subsidized roads no? Perhaps people would telecommute. Let them eat cake, downtown, in the currently empty rowhome. If the road owner has a monopoly on the route then let them charge whatever they will, or let the road run into as much disrepair as they want. People could choose to take the new profitable train line, or the new profitable ferry line. Life needs to slow down to manageable speeds anyways. We have the internet for instant gratification. Things can be delivered instead of going to the mall or grown instead of going to the market. I agree in part, but disagree in part. I agree that there are structural differences in the U.S. that make a simple gas tax increase unfair and probably unworkable. Just not quite for the reasons listed here. First, as Will Stewart notes, actually a great deal of the U.S. is close to a port, if you include the Great Lakes and the Mississippi, Ohio, and Missouri, and other major river systems. Grain from here in central Minnesota has easy, cheap, efficient access to the world via the Port of Duluth at the western edge of the Great Lakes or the Ports of Minneapolis or Saint Paul at the top of the Mississippi. Rail networks fill in the rest of the country, with multi-modal transport hubs minimizing the need to use trucks. So, that's a problem that we can work around, and pushing more freight from trucks to river and/or rail probably makes good sense, from climate change, fossil fuel preservation, and road network preservation perspectives. That said, there remains the problem of our rural and small town populations, where mass transit means two people in a private vehicle. Many of these rural areas really do have no other practical option than a single occupant vehicle. A possible response could be providing residents of rural counties with a partial refund of their gas tax payments. We already provide small business owners, who fill out a Schedule C or a corporate tax return, with an opportunity to deduct the cost of operating their vehicles. We could simply have a per mile income tax refund for drivers who live in certain parts of the country. Vehicle mileage is tracked when a car is sold or scrapped, so there would eventually be a reconciliation between reported mileage and an odometer that would need to correspond. The incentive to buy a more efficient car is not lost, as the refund would be based upon total mileage, not actual cost. As these drivers replace their less efficient cars with more efficient vehicles, they would get to pocket the difference in their refund, or they would be penalized if they chose to keep operating less efficient vehicles. The refund would need to be somewhate less than the cost of operating even the most efficient vehicle, so we don't create an incentive to drive around in circles just to run up the refund. So, while there are differences between the US (and Canada and Australia) compared to more densely populated Europe, I don't think that means that a gas tax or the equivalent can't be made to work here. Post Peak Oil farmers, rural residents and EXURBANITES will simply need to drive much less. In many rural counties, much/most of the population are exurbanites. A small farmette (say 5 or 10 acres), a job in the city and a long daily commute as a lifestyle choice. A PRIME candidate for conservation, not someone to be subsidized ! For real farmers, back to past. I remember one grandfather that "went to town" (pop 6,000 or so) every other Friday if the weather was good. "Town" was about 12 miles away. The other grandfather was close to Centertown (pop. 300, walking distance, 1.8 miles) and went there often, but went to the county seat (pop. 5,000 back then I think, about 15 miles)) a few times/year. Low VMT for rural residents too post-Peak Oil. No need for rebates, etc. Our population density is what it is because we built our cities around cars, not sane and sustainable technologies. Duh. Sounds like you need some History 101. Encouraged and subsidized by various levels of Government feeding at the special interest lobbyist trough. Too bad Big Rail lost out to Big Oil and Big Detroit/ Big Tire. "Let them have buses (the poor)." This then causes sane people to make sane decisions based on insane Government policy- OF COURSE it is profitable to build a car parking tower when the Governent is feeding your customers right into your back yard. I agree that population density in the US is low in large part because of cars. The question is now: how do you lower oil consumption given that density model - via gasoline taxes or other methods? Thanks for the thoughtful essay. I like the idea of a vehicle efficiency market. It ought to be on all car sales, not just new and it should be hefty and the "MPG balancing point" should be really high like 40+. The devils in the detais as always. What about commercial/industrial vehicles? Do they get a break? Like reforming the tax system, the flat tax sounds fair and good but why isn't it used? Because it's not fair to my favorite business or accounting charity, maybe? Agree - gas tax is progressively less effective as one's income increases so the impact is greater on those less able to pay. The MPG balancing point would move higher each month with an equal sum of money paid (by those below the balancing point) and received (by those above the balancing point. The further the vehicle is away from the balancing point the more paid or recieved. The Vehicle Efficiency Market payouts/receipts would not be linear (see example table below). A simple schedule posted on the intertnet and at car dealers would outline the amounts. It may look something like this if the monthly assessment found the balancing point assessment for the prior month to be 25MPG, for example. Vehicles would be placed in simple "classes" (as they are already by the EPA). Commercial vehicles would have their own separate classes from non-commercial. There are a lot of criticisms of this idea, some of which are interesting points of discussion on their own, but I don't think the takeaway is that we should do this and nothing else. Arguments regarding VEM vs gas tax, VEM vs prioritizing public transport are interesting but I think it's a bit of a false dichotomy. The way I see it, it is a way to clean up the way the US government ALREADY tries to tax us. This is a reason I think it's extremely practicable - the very fact that it's not a total makeover of US energy policy. Under the current tax code, I paid a $2,000 gas guzzler tax on a BMW M3 that gets on average 19 mpg. I got favorable tax treatment on a Land Rover Discovery that gets about 12. I drove a Saturn when I was younger that got 40 mpg with no special tax rebate, but a Hybrid Lexus SUV that is far less efficient would qualify for a tax rebate. This doesn't make sense. It's inconsistent and beholden to special interests and gaming the system. This vehicle efficiency market is definitely not the end all and be all, but it is a good start to improve an existing system. Anything like this would be more fair and promote more positive externalities than what's in place. This vehicle efficiency market is definitely not the end all and be all, but it is a good start to improve an existing system. Anything like this would be more fair and promote more positive externalities than what's in place. As Morgan has pointed out repeatedly - A gas tax is not viable in the US. US citizens are in large ignorant and think that consuming Oil is their God given right. To this end this vehicle efficiency is a good start. As has been pointed out in other posts more drastic measures need to be taken to ensure higher density living. The average age of the passenger and light truck fleet is about 9 years. Average vehicle lifetime is over 15 years. If we assume all vehicles die at age 15, then each year we would replace 6.7% of vehicles with new models. The small improvements in efficiency each model year means we are talking about 20 years to make any kind of significant dent in fleet consumption. Fossil Fuel Taxes can go a long way toward reducing petroleum demand and supporting demand for higher efficiency vehicles. As fleet efficiency rises, so should the fuel taxes to offset reductions in consumption. These taxes should be set at a fairly high level and be offset by corresponding cuts in payroll and income taxes. This gives folks lots of incentive to conserve and upgrade equipment. The notion that the US is different is right. Not because we are fundamentally different, but because politicians have sold themselves and us on this Freedom At All Costs mentality. How dare you do anything that might restrict my lifestyle! How about starting over and presenting this whole argument as the patriotic thing to do. When it came to the Iraq war, politicians had no problem questioning each other's patriotism in the face of makeing what were likely the wrong choices. Why can't we question anyone's patriotism if they oppose Strategic Conservation and the Strategic Equipment Upgrade Plan. This to me is an issue of salesmanship not some fundamental difference between the US and EU. You imply that taxes like those in Europe would be too dramatic in the US to work. However, you don't specify how drastic a VEM system would need to be in order to reduce US consumption to European levels. I'll venture to guess that because VEM affects only one piece of the consumption equation, VEM will have to be much more drastic than a systemic fuel tax to achieve the same consumption goals. VEM has much in common with CAFE: inefficient vehicles subsidize the efficient. The loopholes, unintended consequences, and ineffectiveness of CAFE are legion. Just about every problem with CAFE will be a problem for VEM. One distinction between the two systems is that VEM will ratchet up due to market forces, but CAFE requires an act of congress. Each proposed CAFE increase has met with huge opposition from various parties. VEM, as it automatically ratchets up, will be met by this same opposition to create additional loopholes or cancel VEM. So even if VEM is automatic, it will meet the same opposition as CAFE in the end. The simple answer is: I don't know how high the VEM balancing point would have to be to match European level efficiency. The goal is simply to set efficiency levels in motion higher with constant month-by-month improvements. A VEM would remove efficiency from the stagnating influence of lobby groups and vested interests. The monthly balancing point would be decided by the car-buying public. How could any politican argue with the decision of the public as to what the efficiency level should be. One of the reasons given by folks buying SUV's is "safety". Basically, driving around armored by thousands of pounds of metal is - all else being equal - arguably somewhat safer than being in a light vehicle. When you throw "protecting one's children" into the mix, it becomes easier to rationalize what one subconsciously wants to do anyhow, which is to be big and scary and powerful. Unfortunately, relative safety depends on size assymetry with whatever one crashes into. Thus, those driving an SUV make themselves "more safe" at the cost of making those in smaller vehicles "less safe" with regard to collisions. So one person's "safety" is another person's "danger", yet it's currently entirely legal to pursue escalation of this disparity with the nonchalance of a sociopath. Here's a modest proposal: make airbags illegal in large vehicles to reduce the unfair and irresponsibly-motivated safety disparity, and establish maximum-safety standards for the US fleet. US crash standards could determine the likelihood of death in a head-on crash between, say, an Escalade and a Honda Civic and institute design mandates in the larger vehicle to assure statistical damage parity. This could range from impalement spikes on the dashboard and the back of the front seats, to automatic garroting cords rather than seatbelts, to a shotgun shell in the steering column set to discharge into the driver's solar plexus by the same circuitry which deploys the Civic's airbag. In addition, statutes could be rewritten so liability for accidents would always fall on the driver of the larger vehicle when the size disparity was greater than 2/1. And of course large vehicles might be reclassified as "assault weapons" for identical reasons as machine pistols, and incidents of death or injury prosecuted in the same manner. As always, a little sane reflection provides a clear solution to the problem. But I do think that sufficient financial incentives do get folks to On Average do what is in the best interest of everyone. People make those kinds of choices all the time, otherwise most everyone would already be driving SUVs for ego or safety reasons. You've got my vote. I'd like to see a special provision whereby talking on cell while running into a cyclist would add a hate crime enhancer. So, even if motor vehicle driver survived one of your very reasonable measures, there would be a mandatory additional sentence of 10 years hard labor. A disabled friend of mine in Las Vegas who got around on a recumbent trike had a "carry" permit and maintained he had the right to put at least 4 rounds into any vehicle which crowded him on the road. He never exercised that right, but I couldn't entirely fault his logic. The only problem with bicycles is cars. This is the absolute truth. I'm a bicycle advocate and activist, but even I hesitate to over promote cycling in traffic with many individuals. It takes years of experience to cycle in traffic and have some chance of surviving. Many people I talk to are simply not motivated enough to take the chance - or to take the chance of letting their kid bike to school. I think most cycling occurs by driving an SUV to an air conditioned "health" club and listening to loud music while basking under artificial light and spinning some kind of bike thing that does not go anywhere. But, it is "safe". Thursday I was at a seminar (superb speakers by & large) and the aim of local bicycle plans WHICH ARE BEING IMPLEMENTED was to raise bicycling modal share in New Orleans to Copenhagen and Amsterdam levels. Already 3% of commuters by bike. I'm wondering who pays the buyer for buying a fuel efficient car? Right now, someone who buys a hybrid or an electric vehicle gets a rebate from the government, so it would seem that one would get two rebates in this case? It would appear that in this case, Jevon's rule would still apply as I'd get a rebate or two that I could then add to what I would normally spend for "fuel". Right now, what I'm seeing in my environment is that with the loss of jobs and people having less money to spend on gas, a few more than usual are using public transit; more kids are taking the bus to school instead of driving their cars (which range from fuel efficient to SUVs). If we're going to keep the density patterns, the transportation patterns, and we don't want to degrade discretionary income, then I suppose an efficiency rebate might help, but if, rather, we want to change transportation patterns and also not hurt the working poor more than we have to, then "forcing" them onto public transit by imposing a gas tax would be the way to go. This is also a more universal tax in that everyone is affected, while your efficiency rebate would tax the poor (who can't afford an efficient car) and reward the rich (who can afford the car). Anyway, I don't know the answer, but I sure don't think that you have the answer, either. The problem I have with this analysis is that when one buys a car, the size one settles on is only slightly dependent on the cost of fuel. When I bought my car three years ago, the size was dictated on what I needed to haul. Your mpg incentive does not account for people's needs of different size cars, at different times, and penalizes those that legitimately need a larger vehicle. Most people buying new cars have families. There have other discussions about how in Europe it is easier to drive less compared to the US. I think that again can be boiled down to what people need to haul, and parking. Europe -- easy walk to food market; good downtown shops where it is difficult to park nearby. US -- grocery store not nearby, and definitely not a daily trip, that requires a car; shops mostly in the suburbs; downtown usually only for banking or office workers with no shops. It is no wonder people drive in the US. Oh and the last serious politician to advocate an increased gas tax was John B. Anderson -- remember him? I thought not. First, there are major differences in population density between the U.S. and Europe. The EU has 500 million people on 4.3Mkm2, and the USA 300 million on 9.8km2. But notice that about half the USA is very sparsely-populated. Most of the people live in areas as densely-populated as the EU. There's a good reason Podunk, Idaho doesn't have a well-run and frequent cable car or train system. There's no good reason Houston doesn't have one. Considering greater urban areas, not just the inner cities, Tokyo has a density of 4,000 people/km2, and LA 8,000. London has a density of 1,100, and Detroit 6,900. Paris is 750, and Houston 3,400. Which has the better public transport system? Population density over the whole country is irrelevant. What matters is the density where people actually live. And even there we find that there's a very wide range where public transport is useful and can be made to work well. In the U.S. two large coastlines require commercial trucking to haul goods inland. You're forgetting rivers, and railways. Across the eastern half of the US - again, looking at where people actually live, there are many navigable rivers. Already they're used; but they were once used more, and could be used more again. And the use of trucks is not inevitable, there exist already many railways in the USA. Undoubtedly many of those railways require upgrading if they're to carry more traffic. But upgrading railways is surely no more difficult or expensive than subsidising efficient cars. Which is better, a truck using 90% as much fuel, or a train using 10% the fuel? There's a mindset in this article, and it's a widespread one: things must be as they are, nothing can change. It's simply wrong. There are zillions of ways to do things, some good, some bad, some bad alone but good in combination with others, and so on. "Let's create a market for it!" is a quintessentially American response to things, certainly. And it's not surprising that it's a response a commodities trader would come up with. "Create something else for me trade! Awesome! Yay for commissions!" But it's not the only possible response. A fuel tax is in itself useless. People will change from A only if there's B to change to. So a fuel tax by itself wouldn't reduce people's driving much - they just adjust their spending in other areas. What works is when they have options - staying at home, walking, cycling, buses, trams, trains. So a fuel tax - or a carbon tax for that matter - would only be useful if the funds raised from it were used to put in or improve the infrastructure to give people some other way to get themselves and their goods from A to B.
Kiashu thanks for this excellent comparative geographic post. I agree with you that a fuel tax by itself is useless. If however the fuel tax were raised to EU levels over a period of 5 years at a predictable rate of a Quarter A Quarter (ie. 25 cents every 3 months), and payroll and income taxes were correspondingly reduced, the net affect on the average person's pocketbook would be zero. However, once in place, fuel taxes would be a much larger portion of everyone's budget and thus get more attention. This would cause folks to find ways to cut back on fuel consumption by driving less and/or upgrading to a more efficient vehicle. The government would have to compensate annually by adjusting payroll and income taxes to maintain consistent revenue. I would even go so far as to say the net effect on everyone's pocketbook could even be positive. The cost of the underlying fuel would fall as demand falls creating a net positive. By attempting to maintain pocketbook neutrality for low and middle income folks via payroll and income tax offsets, it limits economic impact while enabling consumers to choose how much they wish to pay in taxes. Drive an SUV everywhere and pay a lot? Drive a Prius Hybrid and pay 60% lower fuel taxes? Simply drive less? It is your choice. I'm not much in favour of simply raising vehicle efficiency. Because in the end, if you insist on using 1 tonne of metal and plastic car to move 1.5 people, it's only going to be so efficient... compared to using 7.5 tonnes of bus or tram for 25 people, or 120 tonnes of three-set railway car for 500 people. This is especially so since if you want to change to biofuels, it's easier to convert 1 bus than 16 cars. And if you want to change to moving around with renewably-generated electricity, you can build the renewable power plants and change all the cars, or you can just build the renewable power plants and give the electricity to the train/tram system. Likewise, we already have all the roads we'll ever need built, to set aside one of the lanes for biking is relatively simple and cheap. Certainly much simpler and cheaper than replacing the entire vehicle fleet. Thus, in building and improving infrastructure to give people mass and self-powered transit options, we get MUCH greater efficiency of energy and fossil fuel use. This makes the impact of peak oil much less heavy (if production halves to 43Mbbl/day, but we only use 21Mbbl/day, who cares?) and of course reduces our transport's contributions to global warming. If you give the people the options, they'll take them. I mean, if you want to know what sort of places people want to live in, just ask, "where are the highest real estate prices, and what do the world's great tourist cities look like?" The answer is, "places with no f'ing cars." Places with walkable neighbourhoods, lots of mass transit options, and relatively few cars - these are the places people will paid millions to live in, the places they'll pay thousands to spend 20 hours squashed up in a smelly metal tube to visit. What does that tell you? That people love their cars? With 100% regenerative braking( most hybrids only capture 50%) weight isn't a big issue, but aerodynamic drag is important. Buses are heavy and have high drag, OK when full at peak hour, not so good other times with one or 3 passengers. Same for suburban trains but more flexibility on numbers of carriages. Trams seem a better solution for high density cores of cities, especially if you give priority to tram movement, and saturate at peak hour less frequent out of peak. Changing cars to ethanol, or CNG can't be too difficult, Iran has converted >400,000. "If you give the people the options, they'll take them." That's the problem, a large proportion of people prefer to drive rather than take mass transit, even when it's available, making it slower, and cost more. High real estate cities; Tokyo, London, New York, Toronto, Hong Kong,( being an island saves them from vehicle traffic), good mass transit BUT lots of cars! I wish it wasn't so, but this is the reality, around which we need to plan for the end of oil. And you can have regenerative braking on buses, trams and trains, too. So again you're left with the fact that you can use 1t to move 1.5 people, or 7.5t/25, or 35t/125. Efficiency will be limited by that. Bear in mind that fossil fuels aren't the only depleting resource. So the weight of stuff per person moved would be relevant even if we could power everything with Magic Pixie Dust. And then of course there are issues such as congestion, the cost of roads, noise pollution and so on. None of what you said contends with the simple fact that the most popular places to live and visit have few or no cars. "That's the problem, a large proportion of people prefer to drive rather than take mass transit, even when it's available, making it slower, and cost more." In most cases, it's not an actual preference, it's just what people are accustomed to. I noted before that driving is not a rational choice - but it's not an emotional choice, either. It's just culture and custom. It's like the way in my neighbourhood the young men of Greek background hang out in cafes, the young men of African origin hang out in the spaces between the shops, or in front of the train station. There's neither a rational nor emotional reason to hang out in one place rather than the other, it's just a matter of what they're used to. And people can change that. I mean, for part of your life you're accustomed to being single and can't imagine anything different, then later you're accustomed to being married and if it stops you're devastated. Same goes for working for a living and all the rest. Here Down Under we've seen changes in culture about smoking and water. A classic summer thing was the kids under the sprinkler, dad hosing down the driveway, nowadays people abuse you if they see you watering your lawn. Thus, water consumption is way down. The culture of water use has changed. Smoking used to be cool, people still did it in cinemas when I was a kid - now the rate's way down and if anyone lights up outdoors at a cafe the people at the next table get all snarky - while blithely ignoring the four wheel-drive starting up right next to them. Yet we've also seen huge jumps in public transport use. Rising fuel prices are part of it, but when the price goes back down people don't get back in their cars. Why? Because they have a new custom, they used to automatically get in their cars, now they automatically walk to the train station. Their culture, their customs have changed. Of course there are other contributions like congestion, too. For water and smoking we had a combination of taxes penalising it, regulations restricting it, and advertising explaining the taxes and regs, and promoting reducing or stopping consumption. And it worked. It takes a couple of decades but it works. With the public transport, we already had the infrastructure, some 480km of rail and 380km of trams and god knows how many buses, they just weren't used much. But the option was there for people to use, and given the slightest incentive they leapt to it. Even when the system is near collapse due to atrocious mismanagement. Sure, there are a few people who call their cars "my baby", and a few morons who, even when four of them live together and all have the same workplace, still drive in their separate four vehicles to work, like these drongos. But they're not the majority. For most people, a combination of taxes, regulation and advertising will change their behaviour - if they're given things to change to. Most people in the US and Australia are accustomed to driving, just as 50 years ago they were accustomed to smoking. Life changes. Thank god. With 100% regenerative braking( most hybrids only capture 50%) weight isn't a big issue, but aerodynamic drag is important. 100% regen doesn't exist. Even in the lab. Anecdotal eveidence suggests 70% is the absolute limit, and even then only in places with extremely high congestion. In 'regular' (suburban) driving, it seems ~30% is the limit. On the highway, regen effectivly doesn't exist. 100% regen doesn't exist. Even in the lab. I believe he means percentage of braking energy recovered and returned to the wheels, not percentage of driving energy recovered. The Prius requires very careful driving to keep the braking power within the capabilities of the hybrid system; more powerful systems will raise this limit. The point I was trying to make was that vehicle mass in a hybrid or electric vehicle is less important than air resistance, thus a bus may not be as efficient as a Prius considering it has to run on the same schedule with 0 or 25 passengers. A Prius doesn't go very far with less than one person. Which is simply to say that public transport is only efficient when people use it. In other news, shops require customers to keep open, food you don't eat turns bad, and it's not much use building hydroelectric plants in drought-ridden areas. All public transport should be put in along routes people want to travel - alternately, put in the public transport and then let things be built along that route, in this way new suburbs and businesses appear - and should offer a frequent, reliable and pleasant service. Then you won't have empty and inefficient buses. Regenerative ratios for electrified rail are larger for several reasons. 1) The power is feed back into the wire, not a battery. 3) Less energy is consumed in rolling resistance and, usually, aerodynamic resistance per payload (tonne or pax). The US should more properly be considered to have four coastal areas: Atlantic, Pacific, Gulf, and Great Lakes. By tonnage, the Gulf Coast dwarfs the others (7 of the top 10 largest US ports), and little of that is going to or coming from the East and West Coast regions. Great Lakes ports handle a surprising volume (eg, Boston and Chicago handle similar volumes). Population densities are even more skewed than your map suggests. Draw lines 100 miles inland from the shore of the Great Lakes, the Atlantic, the Gulf and the Pacific. A very large majority of the US population lives in those 100-mile-wide strips. In those coastal regions, a European model of transportation may work. The problems are different in the interior, particularly the vast region between a north-south line at roughly Omaha and another line a couple hundred miles in from the Pacific (the big pale region on your US population density map). You don't want to ignore that region, as it is the area containing most of the US renewable energy resources. But that area is also likely to always require larger per-capita energy consumption in order to maintain a particular standard of living. This is Morgan Downey's post, not mine. I can't take credit for guest posters' ideas. A sincere apology for missing that. Clearly, my comment should have read "Morgan's analysis". Didn't TOD use to have a capability that would allow me to correct that comment error? Once someone has replied to your post, you can't edit it. What works is when they have options - staying at home, walking, cycling, buses, trams, trains. So a fuel tax - or a carbon tax for that matter - would only be useful if the funds raised from it were used to put in or improve the infrastructure to give people some other way to get themselves and their goods from A to B.
Amen, and thanks for the time and effort you put into this great post. And, of course, I'd like to see the infrastructure work include dismanteling facilities that encourage car useage. When I look at your railroad map, I think many of these railroad right-of-ways have been converted to bike trails. Even as a bicycle advocate, I'd be happy to see these revert back to use for trains - IF, as part of the deal, the way we regulate cars results in a safe environment for bikes on public roads. In any event, the rails-to-trails program did keep a lot of these right-of-ways intact for the day when rail became viable again. Actually, the railroad map is not a railroad map, it's a map of current densities of freight. So it's a map of how they're being used now. I'm sure there must be many other lines sitting around unused in the USA. I know there are in Australia. You can see here that in my neighbourhood is a highway, in the middle there's a strip about several metres wide - it's set aside for a railway line that they never got around to building. Or where my old man lives, you can see here an old railway line, now disused. So the space is there for them, set aside years ago, or even built years ago, now neglected. Again, it's an expensive business - but far less expensive than roads, especially when you consider how many people you can take, and how much freight, for how much energy. In Australia now we're introducing unit pricing. So nobody will need to practice long division in their head to figure out if the $2.32 and 440g tin of beans really is cheaper than the $1.08 215g tin. It'll just say, "$0.53/100g" on one and "$0.50/100g" on the other. I think we need unit pricing for public works options, too. If someone says that this highway will cost $2.5 billion and that railway will cost $3.9 billion, we don't have a clear idea of what that really means. But if they tell us it's $1,300 or $250 per person travelling on it over 25 years, but with one you have to bring your own car, the other price includes it, or whatever - that gives us a better idea. Mr. Downey's proposal does nothing to resolve Jevons Paradox - people with the more fuel efficient cars would still drive more, and as the overall fuel efficiency improved, overall driving would increase. However there is a related proposal that would be effective in actually reducing oil usage. It is the "personal carbon allowances" proposal developed in the UK. Here everyone is given a carbon allowance for a specified time period, say a month. If the person uses less than the allowance, then they get to sell the unused portion to someone who needs more than their allowance, on an automatic, computerized market. The total of all the allowances is decreased each year to meet commitments to reduce green house gas emissions. It'd be hard to arrange, though, come up with a carbon price for everything. I know, because I've tried to do it here - just for the stuff households deal with. It's not easy, you have to do a lot of fudging. Fudging's okay for a household, it's okay if we're paying too much for beef and too little for fish, or whatever. But those fudges, those inaccuracies, if spread across a whole economy, they create all sorts of unintended consequences - cattle farms disappear and the fish are all cleared from the sea, whoops. Probably easier would be rationing just direct purchase of fossil fuels. You get say ¢100 (100 kg CO2e) to spend on fossil fuels each month. A litre of petrol costs you ¢2, a kilogram of coal ¢3, a cubic metre of natural gas ¢6, and so on. Only the actual fuels bought directly require surrendering the ration coupons - using the Carbons currency. However, because it's a personal ration, companies supplying goods and services which require fossil fuel input for manufacture or transport, they'd want to buy the ¢ currency/rations. For example coal-fired power stations, they'd need to buy zillions of ¢ currency-rations, and thus the price of coal-sourced power would rise greatly, the cost of wind would drop a lot - solar would probably stay about the same since purifying silicon would be so cheap. In this way, we don't need the Carbons price of (say) organic apples vs conventionally-farmed apples. It just flows through from the price of the fossil fuels going into it. The danger would be what they call "carbon leakage" - people would just produce solar cells in countries where there's no such scheme, and so on. This shouldn't be overstated - some things can't be sent overseas, like electricity production. And anyway across the polluting West we're sending all our manufacturing jobs oveseas anyway, it wouldn't hurt to at least get emissions-reducing benefit from it. But carbon leakage is a concern nonetheless. So the scheme needs to be international, or else there need to be carbon tariffs attached to imports from countries without such schemes. Unfortunately WTO regulations specifically prohibit environmental tariffs. Of course we can tell the WTO to go to hell, it'll probably be happening anyway with the financial crisis, but still there it is, you can see why governments have been reluctant to try this sort of thing. Unfortunately WTO regulations specifically prohibit environmental tariffs. Safety valves. In specific circumstances, governments are able to restrict trade. There are three types of provisions in this direction: articles allowing for the use of trade measures to attain noneconomic objectives; articles aimed at ensuring "fair competition"; and provisions permitting intervention in trade for economic reasons. In practice, the loopholes are used by the US, EU and Japan; when other countries try to use them, the US/EU/Japan appeal to the WTO who then allow them retributive tariffs and the like. Driving would only keep up with efficiency increases if fuel was the sole cost. As it is, fuel is a moderate part of the total cost of ownership in the USA (about 30%) - even before you take driving time into account - so it is economically unlikely that driving distances would keep pace with fuel efficiency. "Mr. Downey's proposal does nothing to resolve Jevons Paradox - people with the more fuel efficient cars would still drive more, and as the overall fuel efficiency improved, overall driving would increase." My counter: I had a good think about that (as it is a fair point made by several commentators) and one possible alternative is that a VEM would simply charge those below the MPG balancing point and the cash would go directly into public transportation rather than subsidising more efficient vehicles. There would still be the upward pressure on average vehicle efficiency (as car buyers try to avoid paying extra for vehicles below the MPG balancing point) without the negative consequence of having the more efficient vehicle buyers drive even more with the cash they receive. This would resolve Jevons' Padarox. Should I be surprised a commodity trader does not believe in free markets ? Instead of offering solutions for non-existent problems, why not concentrate on making the markets work better ? The real problem here is the extreme volatility of oil prices. And that's the direct result of Goldman-Sux and the likes gaming the market in their favor. I'm confident a free market, free of GS and manipulation, will offer best solutions for all our needs. I 100% believe in free markets. The Vehicle Efficiency Market is a free market solution with the price of efficiency set by buyers of vehicles with as little government interference as possible. "as little government interference as possible" means ZERO government intervention. Let the market determine what's efficient and what's not. that in turn will bring a decrease in those sales. We've seen the results of completely unfettered markets and few people now believe zero regulation is beneficial or desirable. Nope, we didn't. You're terribly confused. I hope for the sake of my children and for the sake of this world you're in a minority. I am reminded of the true believer Communists who insisted that the Soviet Union et al were not REAL Communists but a bastardization of what Karl Marx and Lenin proposed. If only "we" would try REAL Communism, it would be idyllic ! It's sort of like saying a particular rocket wasn't a "real" rocket because it blew up. "But the design is still good!" Maybe. But when the tenth rocket built on that design blows up, you start to ask questions about the design itself. Same way, if every time someone tries out a political system it leads to dictatorship, or chaos, or a huge rich-poor gap or whatever, maybe there's something wrong with the design. So you believe people should be able to buy tanks, rpgs, and heroin? You're against tax breaks for new small businesses, and happy to let other countries dump products in yours at under the cost of production to destroy your production of that thing, and then later hike the price up? After a hurricane, can a shopkeeper charge $100 for a bottle of water? Nobody really believes in a free market. Everyone believes in some restrictions. The only questions are what should be banned or restricted, what should be supported, and for what purposes. Actually, I do believe in the free market. The purpose of the government is to protect the free market from non-free-market predators, but within the system adopt a hands-off policy. Tanks and RPGs? By my interpretation of the 2nd amendment, those should be freely available anyway. Tax breaks for some businesses? Only those I deem important to the well-being of my nation (like auto manufacturers that keep toolings for tanks onhand), or otherwise offer a valuable service (which would include breaks for new technologies and concepts). A deductible for small businesses would be fine as well, but it should be determined on size, not on newness. The 100yr old family laundry deserves the same breaks as the brand new startup. Product dumping? If it's an import, I can fix that with a duty. If someone else sells it below cost, I expect a secondary market would spring up quickly anyway. Possibly by their competitors. Extortion after a natural disaster? Yeah, that'd work for a few days. Then you'd go out of business from the boycott. I will make one exception. Competition for monopolies should be subsidized. In some cases I'd even support breaking them up. Luckily, other than utilities, every other necessary service has pretty good competition already. That's not a free market. Product dumping? If it's an import, I can fix that with a duty. "Nobody really believes in a free market. Everyone believes in some restrictions. The only questions are what should be banned or restricted, what should be supported, and for what purposes." Nobody really believes in a free market; not even you. And that's good, because a truly free market is by no means the most efficient system, much less the most effective system. I DO REALLY believe in free markets. Than leaving the decision to "what should be banned or restricted, what should be supported" to GWB, Pelosi or the stupid majority they represent. Tax breaks? I AM AGAINST TAXES...most of them go to bombing countries left and right, building bridges to nowhere, bribes, AIG, GM, GS, lobbies and lobbyists. You mean have other countries send here their not-renewable resources and hard work in exchange for printed pieces of green paper that we have an unlimited supply of…HELL YES! And I pray God keeps them stupid, so they keep doing it, while we reload the toner in the printing presses. - Some people do not believe there are structural differences between US and European oil consumption patterns because of either population density or geography. These people believe that high gasoline taxes in Europe created an infrastructure which requires less oil consumption. My counter: Europeans started from a point of high population density and people there could subsequently tolerate taxes in Europe because of this. These taxes encouraged further dense living patterns. People in the US started from a point of relatively low population density and low gasoline taxes in the US then supported and encouraged this. The end result is that today we in the US find ourselves in a situation where, because of the way people live, gasoline taxes are politically untenable. My goal is to find a politically acceptable solution to achieve the same end result as a gasoline tax: more efficient vehicles and ultimately increased use of public transporation. - Some said that increasing vehicle efficiency would simply increase oil consumption as driving becomes cheaper. My counter: I had a good think about that (as it is a fair point) and one possible alternative is that a VEM would simply charge those below the MPG balancing point and the cash would go directly into public transportation rather than subsidising more efficient vehicles. There would still be the upward pressure on average vehicle efficiency (as car buyers try to avoid paying extra for vehicles below the MPG balancing point) without the negative consequence of having the more efficient vehicle buyers drive even more with the cash they receive. This would resolve Jevons' Padarox. Thanks for coming to The Oil Drum and offering your article. As you can see, there is a stimulating debate here at times, where steel sharpens steel, so we all benefit. I will venture to speak for others when I say that we hope you visit frequently and share generously in the give and take. You've shown yourself to be thoughtful in a re-examination of your original proposal, just the qualities an energy analyst needs to navigate the shifting sands of limited supply and relatively inelastic demand. You erected a straw man and then attacked it. You did not even come close to correctly stating the opposition to your proposal and flaws found in your logic. VEM does nothing (actually makes it worse) on the most important front, reducing VMT, changing our Urban/Suburban form and creating efficient Non-Oil Transportation. It is nothing but a more complicated form of CAFE. If the political will is not there for CAFE, it will not be there for VEM. As far as history goes, it was not some unsupported (and I believe incorrect) theory on density, but the fact that the USA exported oil (see Saudi, Iranian & Venezuelan gas prices today) till after WW II, while the EU imported oil. When Norway went from oil importer to 2 million b/day exported, they decided to keep their highest in the world gas taxes. They saw where cheap gas would lead. The USA went the cheap oil route ala KSA, Iran, Venezuela. The post-WW II boom in Suburbia was driven by a variety of gov't policies to subsidize it. The reasons are many but none were good. The EU did not subsidize and promote sprawl like the USA. That is the delta. As for gas taxes, that is the Reagan "something for nothing" "We do not have to pay for it" "Deficits do not matter" legacy. Expand gov't (especially the military) and cut taxes. That good Republican Eisenhower raised gas taxes 5 cents/gallon; back when a nickel bought a good sized candy bar. So it is the political legacy of Reagan that prevents rational policy. Hopefully the revulsion against GWB will be strong enough to erode the Reagan legacy. To be fair, there are a variety of other reasons for the difference, including earlier prosperity in the US (Europe is slowly sprawling out as well, especially the recently-prosperous, like Ireland). Based on some studies I've read, though, a significant amount of the difference is due to zoning regulations; essentially, European (and Canadian) urban areas have zoning restrictions which are by design more amenable to public transit. As a result, unsurprisingly, public transit is more well-developed in those nations. It's possible that there's something geographically different about the USA, but it's clear that there were a raft of different choices made, and it's virtually certain that those choices are responsible for some of the difference we see today. One delta is that preserving farmland has some strategic value in the EU, and preserving open spaces has some social value in the EU. Neither has any value in the USA. Sweet, I can get a new car for a negative price! You make a good point. However, any vehicle in the plan would obviously have to meet US safety and emission standards. From what I've read, the $2,500 Tata sold in India does not meet US safety or emission standards (the Tata, for example does not have airbags) which adds many thousands of dollars onto a vehicle cost. The VEM would be structured such that the cash payment for a vehicle maxes out at a certain dollar level (e.g. $3,500). The goal of a VEM is to move the average MPG of vehicles (meeting US emissions and safety standards) steadily higher - not to provide incentives to anyone to buy more vehicles. We cannot depend upon the world oil supply to meet current demand and we can foresee oil price spike shocks to our economy within 5 years. As a result, for our economic security, I am today ordering the formation of a National Oil Rationing Database that will be used to ration oil and gasoline as required. Anyone who requires an automobile to get to work should transition to fuel efficient transportation ASAP. This smacks of an exemption for the US. I remember George Bush's commnent that the US standard of living was not up for negotiation. Dream on guys. We have seen the US squander barrel after barrel and the way to improve the woeful fuel consumption figures is to tax transportation fuels. The tax revenues could, but highly unlikely, be used to fund an effective public transport system. I would point out that US refineries are configured for gasoline production(40%)little of which is used for hauling goods over long distances, so that argument does not hold. As for diesel tracks then an increase in the gross weight will allow higher payloads. In Europe payloads are up to 28 mt whereas in most of the US 20 mt payloads are the norm. This adds to costs and reduces fuel efficiency in tonne/km/lt. The US needs to accept that oil profligacy is over and the sooner that is accepted then the better for mankind.Higher fuels taxes will be the most expediant way of reducing demand and boosting energy efficiency. By that standard, so are European refineries; they produce more gasoline than they can use. The US has very few diesel-powered personal vehicles, so the US exports excess diesel to Europe and Europe refills the tankers with excess gasoline and sends them back.